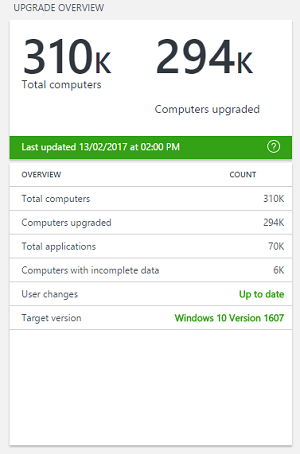 You can use Upgrade Readiness to prioritize and work through application and driver issues, assign and track issue resolution status, and identify computers that are ready to upgrade. Upgrade Readiness enables you to deploy Windows with confidence, knowing that you’ve addressed potential blocking issues. Based on diagnostic data from user computers, Upgrade Readiness identifies application and driver compatibility issues that may block Windows upgrades, allowing you to make data-driven decisions about your organization’s upgrade readiness. Information is refreshed daily so you can monitor upgrade progress. Any changes your team makes, such as assigning application importance and marking applications as ready to upgrade, are reflected 24 hours after you make them. When you are ready to begin the upgrade process, a workflow is provided to guide you through critical high-level tasks. Each step in the workflow is enumerated using blue tiles. Helpful data is provided on white tiles to help you get started, to monitor your progress, and to complete each step. Important: You can use the Target version setting to evaluate computers that are running a specified version of Windows before starting the Upgrade Readiness workflow. By default, the Target version is configured to the released version of Windows 10 for the Current Branch for Business (CBB). Upgrade overview: Review compatibility and usage information about computers, applications, and drivers. Step 1: Identify important apps: Assign importance levels to prioritize your applications. Step 2: Resolve issues: Identify and resolve problems with applications. Step 3: Deploy: Start the upgrade process. Additional insights: Find out which MS Office add-ins are installed, and review web site activity. The default target version in Upgrade Readiness is set to the released version of the Current Branch for Business (CBB). CBB can be determined by reviewing Windows 10 release information. The target version setting is used to evaluate the number of computers that are already running this version of Windows, or a later version. The number displayed under Computers upgraded in the Upgrade Overview blade is the total number of computers that are already running the same or a later version of Windows compared to the target version. It also is used in the evaluation of apps and drivers: Known issues and guidance for the apps and drivers in Upgrade Readiness is based on the target operating system version. You now have the ability to change the Windows 10 version you wish to target. The available options currently are: Windows 10 version 1507, Windows 10 version 1511, Windows 10 version 1607, Windows 10 version 1703, Windows 10 version 1709 and Windows 10 version 1803. You must be signed in to Upgrade Readiness as an administrator to view settings. On the Upgrade Readiness Settings page, choose one of the options in the drop down box and click Save. The changes in the target version setting are reflected in evaluations when a new snapshot is uploaded to your workspace.